It's not too late to achieve your New Year's resolutions! 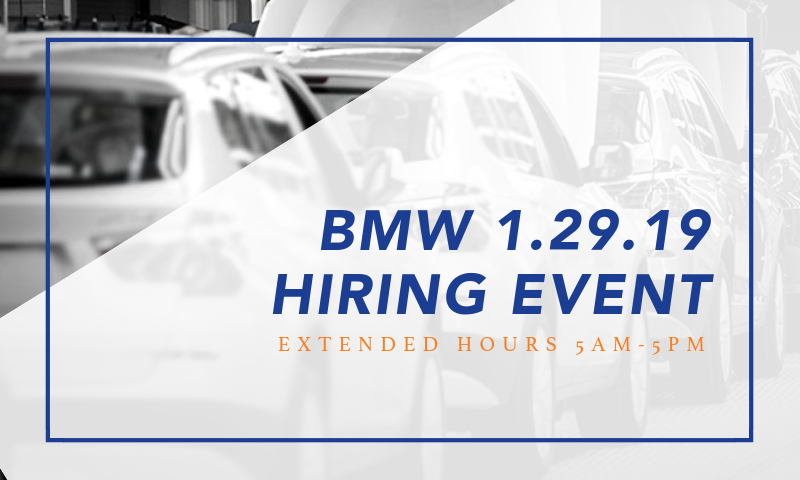 Attend the January 29, 2019, BMW extended-hours hiring event at the MAU Greenville branch located at 7993 Pelham Rd from 5:00 AM to 5:00 PM for a chance to join the team at BMW as a Production Associate, Forklift Operator, or Logistics Trainee. You can join the team at BMW offering starting pay of $16.50- $17.50 / hour, major medical benefits, paid holidays and vacation, and so much more! Click the map for directions to some of the best jobs in South Carolina. Here at MAU, we know there is power in our people. You could be a key element of the driving force that helps produce thousands of X-model vehicles at BMW's state-of-the-art, 1,150-acre,7-million-square-foot campus. The BMW Spartanburg Manufacturing plant is the BMW Group global center of competence for BMW X models and manufactures the X3 Sports Activity Vehicle, X4 Sports Activity Coupe, X5 Sports Activity Vehicle, X5 M Sports Activity Vehicle, X6 Sports Activity Coupe, X6 M Sports Activity Vehicle and the X7 Sports Activity Vehicle. MAU is hiring Production Associates, Forklift Operators, and Logistics Trainees at the 1.24.19 BMW hiring event to help produce the ultimate driving machine. Attend the month-long BMW forklift hiring event at the MAU Greenville branch located at 7993 Pelham Rd every Friday in April from 9:00 AM to 4:00 PM for a chance to join the logistics team at BMW. Join the force that helps produce the X-model vehicles at the largest BMW plant in the world. Race to your new career with MAU at Bosch! Attend the MAU at Bosch hiring event on Saturday, April 6, 2019, for the chance to join the team as an Assembler. Do you know what time it is? If you said, “It’s time for the MAU Upstate Manufacturing Job Fair,” then you are correct. This will be one of the biggest hiring events of the year with over 20 open positions at different manufacturing plants throughout the Upstate.